You got this great idea, and you want to publish a post about it? So what do you do? You spend a decent time in finding the correct keywords. As there are many keyword research tools, we all know that Google keyword research planner is the best. But, sadly it is complicated, takes a long time for a beginner to be familiarized and does not provide accurate search volume. This is why you need to use Keyword.io. Keyword.io makes the task of keyword researching extremely easy especially for content writters. With Keyword.io finding the appropriate keywords can be accomplished in a matter of seconds. Keyword.io can find the correct keywords in seconds! Google Keyword Planner provides a rich set of information but sadly it is a complex tool, and if you have recently started researching keywords you might struggle in using it. This is why many companies have started developing alternatives. 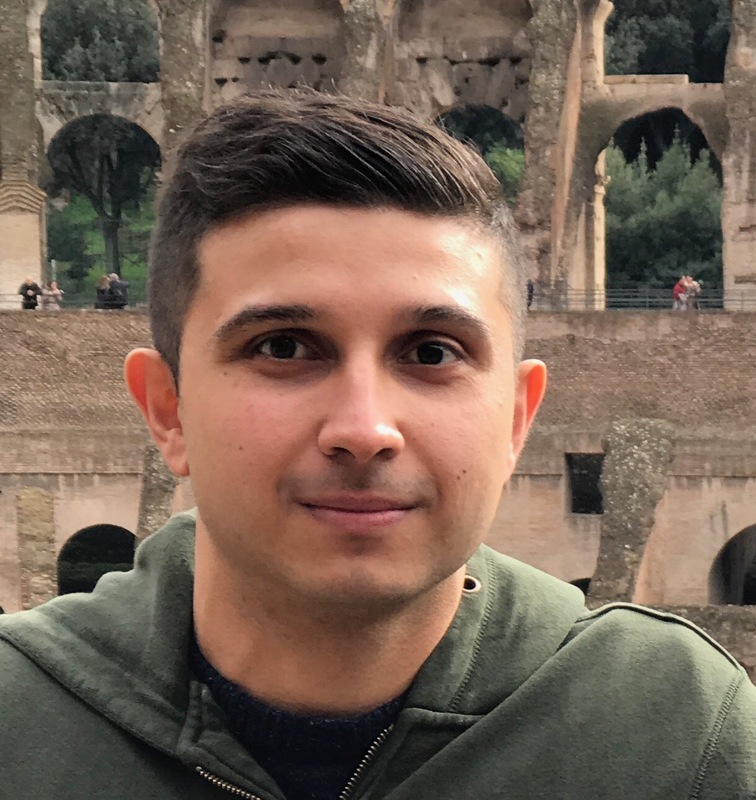 We have been using Keyword.io and we are absolutely loving it. It has a user friendly interface, fast and provides decent number of keywords . How can I find keywords using Keyword.io? Upon visiting the homepage, all you need to do is enter a list of primary keywords and select the target country. In the picture, below “car engine Toyota” is entered as the keyword and “United States” the country. 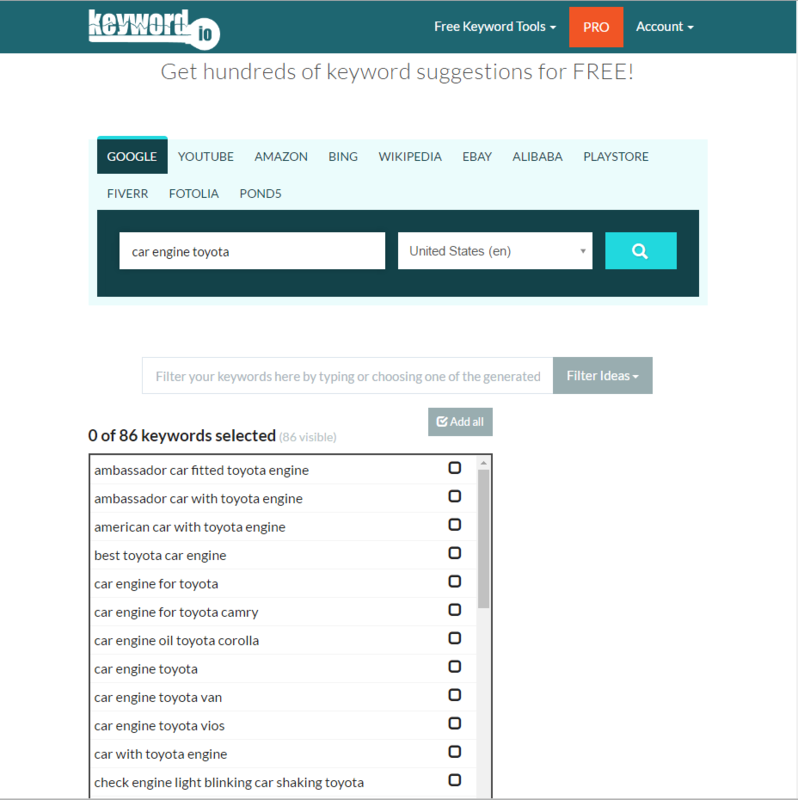 Keyword.io generates a list of similar keywords. Since there are many keywords you get the option to select the preferred ones and export them. 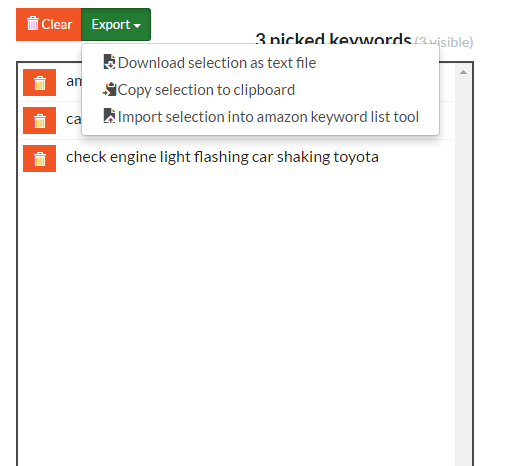 Once, the list of keywords are generates you can select the preferred onces download them a text file, copy to clipboard or import into the Amazon Keyword list tool. The same keyword search if performed using Google Keyword Planner would take few minutes longer. Yes, there is no denial that Google Keyword Planner provides much more data such as Keyword Groups, traffic estimates but with Keyword.io provides a pro version which includes Keyword planner unique features! Is there a pro version ? Keywords relevant to your topic search. No hiding of information – You get to view almost the seed of keywords. View Search Volume, Competition, and CPC from Adwords. Whether you should use Keyword.io or Google Keyword planner can be a difficult dission. Since, both are extremely helpful but Google Keyword Planner is targetted for more experience keyword researchers. If you are writing a content which you think it is important, it is best to start using Keyword.io and importing the keywords in Google Keyword Planner. This might aid you in getting more accurate keywords.